Even the most seasoned bike commuter can find themselves checked at the front door on dark winter mornings. It takes a special kind of determination to keep cycling through the colder months. Especially when the car, tube or bus seem like a much warmer proposition! Still, many people do, and they reap the benefits of this continued exercise. The advantages range from keeping trim for Christmas to raising endorphin levels to combat those ‘winter blues’. Even improving their chances against health problems such as cancer and heart disease. Winter cycling isn’t just about willpower (although we’ll admit it takes a lot!). It’s also about being prepared; knowing how to keep yourself and your bike ready to handle everything that mother nature can throw at you. We’ve listed our top tips to keep you and your bike in the best condition. Now you can keep up the cycling smugness all year round! 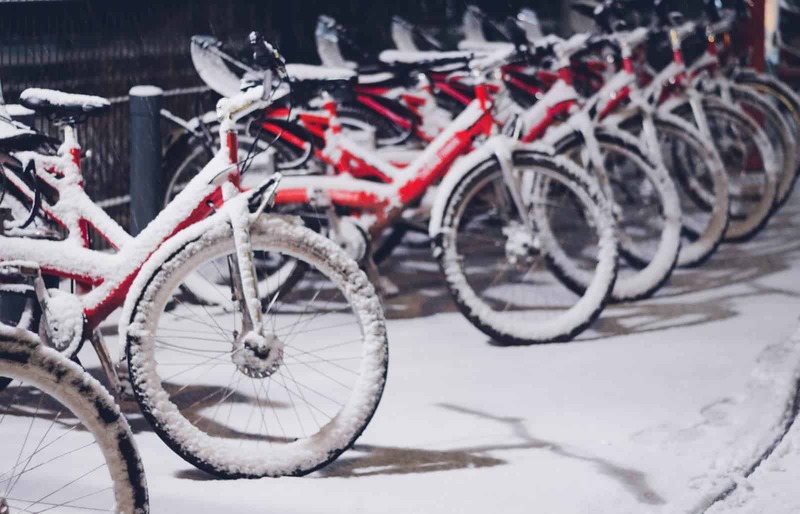 Keeping your bike maintained is key to help keep you cycling in the winter months. 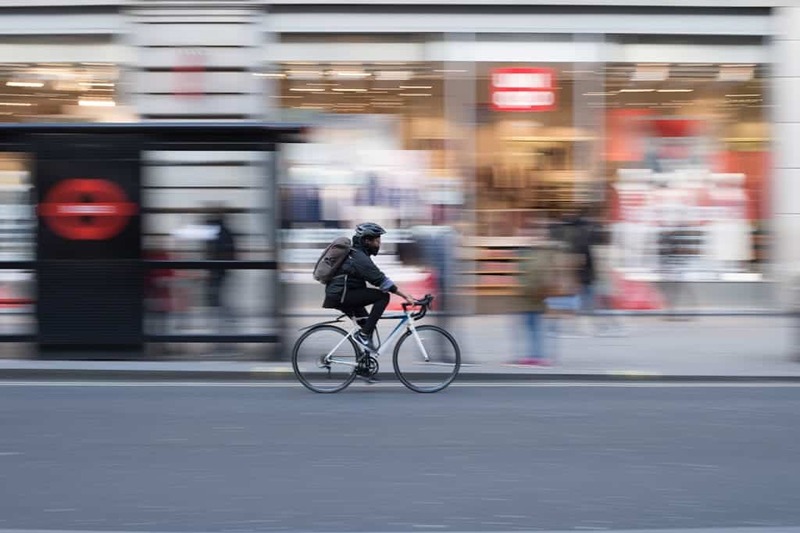 Let’s face it – it’s not going to take much to convince you to ditch the cycle helmet and catch a cab instead if you’re about to set out at 7am in the morning and find your bike isn’t ready to go. Winter conditions can cause damage to bike components very quickly. Water ingress, traffic grime and salt from road grit combine in a mixture that can end your cycling intentions in a heartbeat. After each day’s riding, use WD-40’s BIKE Degreaser to clean grease, grime and road dirt from chains, cassette sprockets and derailleurs. Simply spray on and wipe away with a cloth, repeating until the fast-acting fluid comes away clean. It will take minutes, and ensure that any chain-seizing residues are dealt with before damage can occur. 2. Invest in some mudguards. Yes, they’ll ruin the lines of your sleek and beautiful road bike. But they will save you from the embarrassment of turning up at work with mud spattered up your back! Even on urban roads, it’s surprising how much mud, grit and slush can build up along the kerbs. Mudguards can help keep you protected from what your wheels fling up. It’s also considerate towards your following cyclists to ensure you’re not creating a rooster tail of muck as you go! 3. Cleaning doesn’t need to be a chore. Cleaning your bike in the summer can be a nice weekend chore, but in the depths of winter it’s the last thing you feel like doing. Keeping your bike clean is essential all year round, especially when mud, water, slush and other layers of grime can quickly build up. Try WD-40’s exceptionally easy to use BIKE Cleaner, a total wash which can clean your bike in minutes. Simply spray all over a freshly rinsed bike, leave to work for a few minutes, then sluice with fresh water for a sparklingly clean finish. It’s safe to use all over, from handlebars and spokes to pedals and seat. You’ll save time, effort and have a nice clean bike come Monday morning. 4. All the gear and no idea. As well as changing up your bike care for winter, you need to change up your wardrobe too. Layering is key when it comes to cold weather cycling. Although the temperature is much colder, you can still produce a lot of body heat through your movements. Invest in some good sportswear that will help wick away moisture and provide good air circulation. This way, when you get into your ride and start the blood pumping, you won’t overheat. The parts of your body most likely to feel the chill are those that are exposed to the elements. Coverage is key; get a good pair of gripped gloves, a headband to keep your ears warm, and some specialist cycling leggings to fend off the windchill factor. They’ll take the worst of the dirt and you can change back into nice, dry trousers when you arrive. It’s a known fact that cycling can be a risky business, especially on busy roads in dark, challenging conditions. Invest in good lighting for your road bike to ensure you can be seen by fellow road users in all conditions. Rechargeable LED lights are now available for even the most frugal budgets, and can provide essential light to help you be seen and stay safe as you travel. Also, as unfashionable as it may look in the cold light of day, light reflective clothing to wear as you ride is an absolute must. Think hi-vis jackets and reflective vests to make a real retro fashion statement! If you want to similarly kit your bike out to match, consider using highly effective high-vis reflective tape to make wheel rims stand out in headlights. 6. Lubricate to suit the conditions. Everyone knows you need to keep your bike lubricated all year round to maintain, protect and extend the life of moving components. Any lubrication is good lubrication, but in winter you need to consider the elements, and whether your current product can stand up to the extra harsh conditions. From mud, dirt and increased moisture in the air, to frost, snow, salt grit and freezing overnight temperatures. WD-40 BIKE Wet Lube is specially formulated for challenging conditions, resisting water ingress and repelling mud, grit and dirt. Components will be kept clean and working soundly even through the worst winter storms. Smooth and easily penetrating, it can get right down into the smallest spaces, and expel water that may otherwise rust, corrode or freeze to cause unseen damage. Use it to lubricate your chains, derailleurs, sprockets and any moving parts at risk of spray as you ride. 7. Think about your tyres. Road conditions are more treacherous in winter, so consider investing in some winter tyres. Slightly softer, wider tyres will help give you more traction on difficult surfaces, be it frosty roads, wet road markings or slippery manhole covers. If you’ve got the money to shell out, then get some specialist tyres that are more resistant to punctures and damage. No one wants to get stranded at the side of the road with a puncture, but worse so on a dark February night with little help in sight. If this is your first winter commuting by bike, then it can’t hurt to give your route a once over. When you know your end destination, it can be very easy to follow the same route every day; usually the one that gets you from A to B in the least time possible. But in winter, there may be an alternative side road, or junction, or even a cycleway that will prove to be safer, easier and ultimately better for you to use. If it means you can keep safer as you cycle then it’s worth a slightly longer journey, and may even become part of your summer route too. If you’ve got any other tips, we’d love to hear them. Especially if you’ve incorporated WD-40 products into your winter care routine. And to all the cyclists out there, stay safe and keep peddling!